What climate change has to do with Irma and Harvey. The stories we tell ourselves are more influential than science. And the back-to-back storms are quite a story. Hurricane Harvey making landfall shortly on Aug. 25 on the mid-Texas coast, and Hurricane Irma as it moves toward the Florida coast on Thursday. Hurricane Harvey was an aberration, a storm that delivered such an unprecedented amount of rain that it left meteorologists without words. It broke records and forced us to make new colors for our precipitation maps. It has killed 70 people so far. And it is already happening again. Hurricane Irma, which is currently moving through the Caribbean toward Florida, is equally unprecedented and already deadly. How can two storms cause so much carnage in a span of mere weeks? How do we care for the victims of Harvey while preparing to care for the victims of Irma? How can journalists even cover both catastrophic events without taking attention away from one or the other? And of course, how do we watch these terrible storms happen and not get so angry that we finally say enough? That exhausted, exasperated, depressed enough would be in reference to climate change, of course. For many, these storms seem to be all the evidence we need to show that climate change is not a faraway problem—it is an immediate threat. It is killing us right now, and taking our homes right now, and if our president wants to swoop in and help people recover, he would do well to also start taking the science seriously so that he becomes able to not just respond but perhaps prevent. This perspective is both valid and a bit naïve. Climate change is both one of the more politically charged topics of our day and a notoriously tricky story to tell. 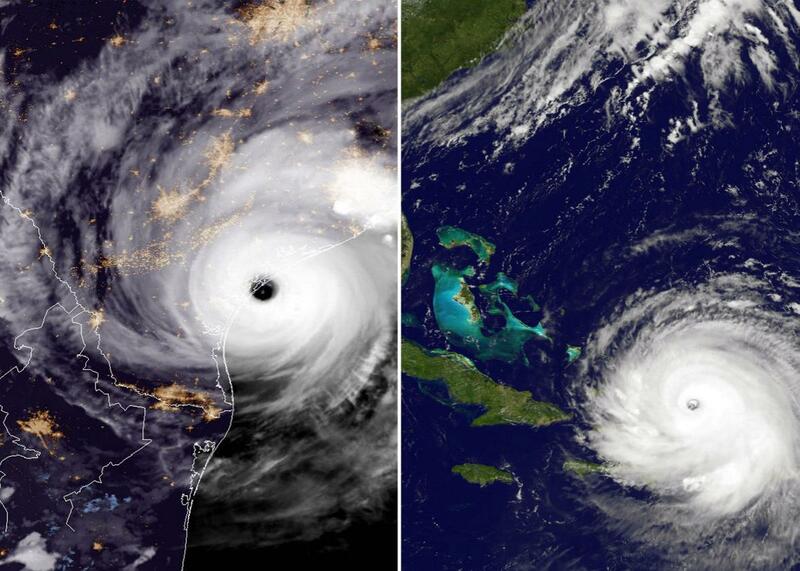 For one thing, even though laypeople are willing to connect the events to the assumed cause, it is hard to show direct causation between a single hurricane (or two) and climate change. These are, after all, natural events that have been happening forever, and making the connection without the scientific proof leaves you exposed to (unfair and unreasonable, but nevertheless existing) accusations of politicizing a tragedy. But perhaps the extremeness and proximity of these two devastating storms might help us change the narrative when it comes to connecting the dots between climate change and natural disasters. First, for the science: While for some it may be enough to know that climate change makes hurricanes more frequent and more intense, the process of attributing individual events to climate change is tough. It will actually be easier to do for Harvey than for Irma. Ben Strauss, vice president for sea level and climate impacts at Climate Central, said that the first scientific estimates assessing climate change’s impact on Harvey will likely be available within the next month—which is fast for science. He attributed this to the fact that Harvey was a massive precipitation event, and scientists have a clearer understanding of how climate change affects that sort of storm. Furthermore, Harvey included coastal flooding, which is more clearly influenced by higher sea levels, a known consequence of climate change. Proving causation for Irma, mostly exceptional in strength as opposed to precipitation, will be trickier, and Strauss estimated that would take at least a year. Strauss stressed that while drawing the connections between a storm and climate change is a useful scientific endeavor, most laypeople don’t need to see the exact causation to fit the narrative to their own personal beliefs. If you think climate change is a problem, you know that one of the consequences is increased frequency and intensity of hurricanes, and it doesn’t much matter if there was the direct causation here. Harvey and Irma are what climate change looks like, and if we want to minimize that, we had better tackle climate change. Connecting hurricanes to climate change requires thinking at a certain level of abstraction. (Or as Strauss put it: Thinking about the causation “gets a little bit metaphysical.”) Many people have too many other concerns right in front of them—pressing needs that make global systems and our impact on them feel very far away from their daily lives. And so if you don’t think climate change is a massive pressing issue, you’re likely to see a large hurricane as just a large hurricane. But that’s where having storms back-to-back might actually help change the general public’s understanding of how climate change plays into hurricane season, says Arthur Lupia, a political science professor at the University of Michigan who studies how people make decisions. Harvey was a visceral event that brought with it an onslaught of stories of the people affected. All the sudden something that felt abstract was tangible—people started to realize “this could happen to my family” or “this could happen to my home.” And now Irma, a second event of catastrophic proportions in a second location, re-emphasizes that conclusion. It makes it much harder to write it off as a fluke, even if it was a fluke, which again, we won’t scientifically know for quite a while. Beyond the tangible terror and fear that comes with witnessing fellow Americans experience such a trauma is the tangible money we will have to pay to clean this up. This is another area where Lupia was hopeful that the one-two punch of Harvey and Irma might help convince people that climate change is worth addressing. Republicans may refuse to believe the science on climate change, but they will pay attention to the fiscal cost of these events. Lupia likened it to the slow reversal we’re currently seeing among some parts of the right around criminal justice. In the 1980s and 1990s, the right was ideologically convinced that we had to take stronger measures against criminals, even low-key drug offenders. In recent years, though, they’ve reassessed that stance—not because their ideology has shifted, but because they’ve realized that pursuing it is too expensive (Attorney General Jeff Sessions being one notable exception). Lupia posited that it might be possible for the same kind of reaction to happen in the wake of Harvey and Irma. As of the latest bill passed by the Senate, Congress is already planning to spend $15.3 billion dollars on Harvey relief, and that number is only going to go up. Once the damage and the numbers from both storms are tabulated, Republicans who are ideologically skeptical of climate change might be more willing to think about how much they hate paying for these kinds of relief packages and at least consider coming to the table to talk more about preparation, or even climate change mitigation, than they were before. Trump is not alone in his event-focused thinking. The five living former presidents also got together to create a PSA about Harvey. The message was kept tightly around the individual storm and relief efforts surrounding it—understandable from a strategic standpoint for what is essentially a 30-second advertisement. We have to live with the fact that our presidents—both past and present—are focusing their efforts on the immediate, rather than the long-term (there’s only one president who still has much say over that, anyway). And of course, there are plenty of immediate needs to be met. But I think there is space for both types of thinking. The connection between science—something plodding, slow, impervious to our desires—and the narratives we tell ourselves is determined by how willing we are to think in abstraction. It may be too soon to know whether Irma or Harvey were directly caused by climate change. But regardless, they are demonstrations of how bad it could get. The stories we tell ourselves are driven by our own preconceptions, our need for comfort, our desire to make sense of the world. It is possible to explain Harvey and Irma away as freak accidents. Perhaps, for some, it may even be comforting. But this time, in the face of all this horror, it is also possible to look at all of the bills we will be forced to pay—in lives, in homes, in actual dollars—and decide that it is enough.